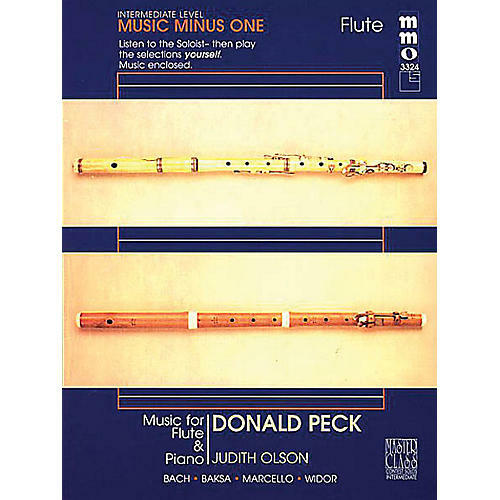 Performed by Donald Peck, flute Accompaniment: Judith Olson, piano Donald Peck of the world-famous Chicago Symphony gives you a solid grounding in intermediate-level solos for flute and piano in this album which will bring you challenges and enjoyment as you advance on your instrument. Includes additional slow-tempo accompaniment versions of selected pieces (Bach Badinerie and Widor Scherzo) for practice or for a slightly slower interpretation. Includes a high-quality printed music score annotated with performance suggestions and a compact disc with complete versions (with soloist) followed by piano accompaniments to each piece, minus the soloist.